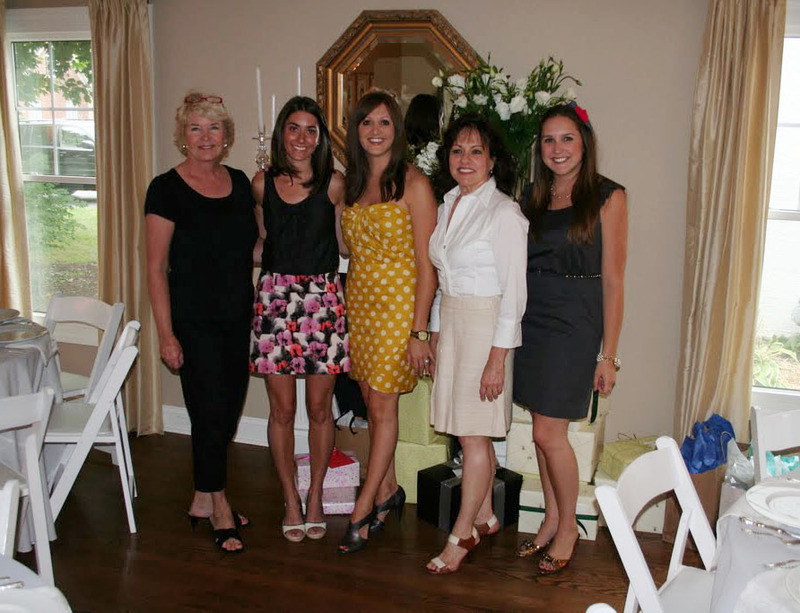 Two weeks ago, my mom, sister-in-law, and I hosted a bridal shower for my sister. You may remember me showing off the DIY invites I created a few weeks ago. 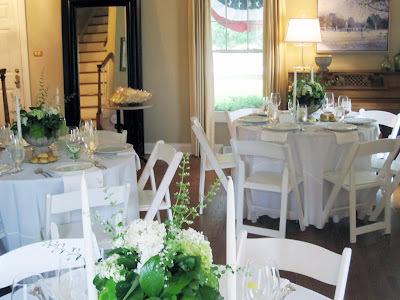 We held the small event at my mom's house, much like we did for her friend's baby shower last summer and my sister-in-law's bridal shower a few summers before. Hey - if it's not broke, don't fix it, right? Seeing as Andrea will be married on a beach this weekend, we wanted to incorporate beachy elements into the decor and use a lot of greenery, as well. 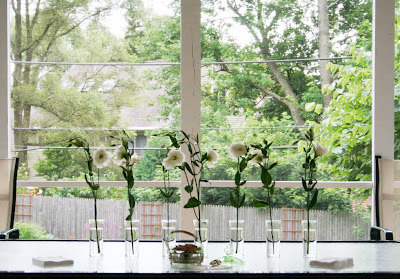 You can see more details of the decor over at Tobi Fairley's blog where I am guest posting today on behalf of Rue Magazine as part of her Design Summer Camp. 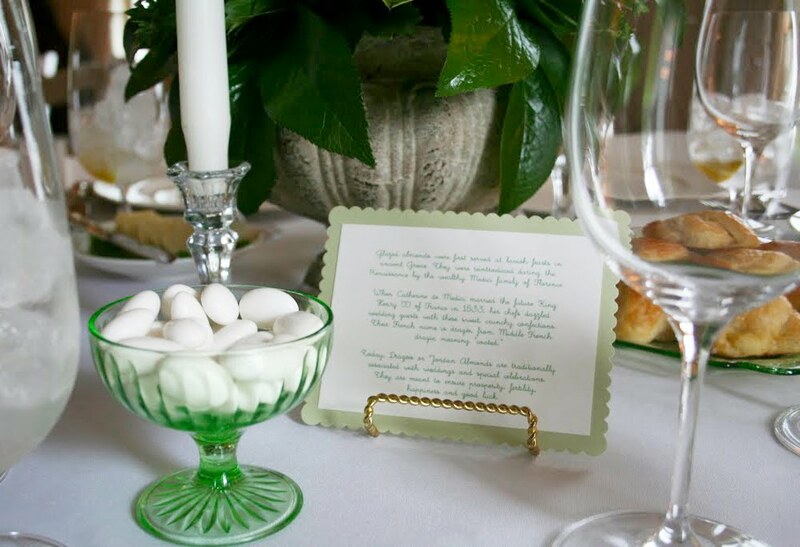 Next to the dragées (more commonly called jordan almonds), we placed a card that detailed a brief history of where they originated. The story is actually kind of amazing - the tradition of candied almonds and weddings actually dates back to the Medicis in Florence! I wore a grey J.Crew dress with ruffled collar, gold Gucci heels, and a J.Crew flower headband. The bride-to-be (centered) wore a yellow Leifsdottir dress and my grey Prada heels, which are totally awesome if I do say so myself. 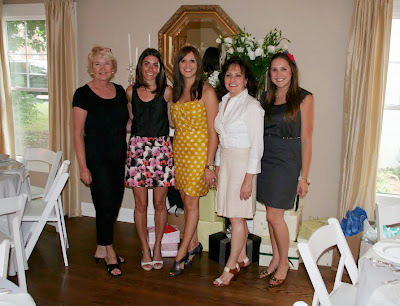 My sister-in-law Jess rocked out a few items of J.Crew's summer line including the pink floral skirt, and my mom, who is pictured next to me, surprised me by wearing these darling shoes by Land's End Canvas - which she bought after seeing them on my blog! One of Andrea's gifts came from my cousin who fell in love with these fantastic ceramic fruit baskets after I posted them on my blog from my visit to Ochre in New York. 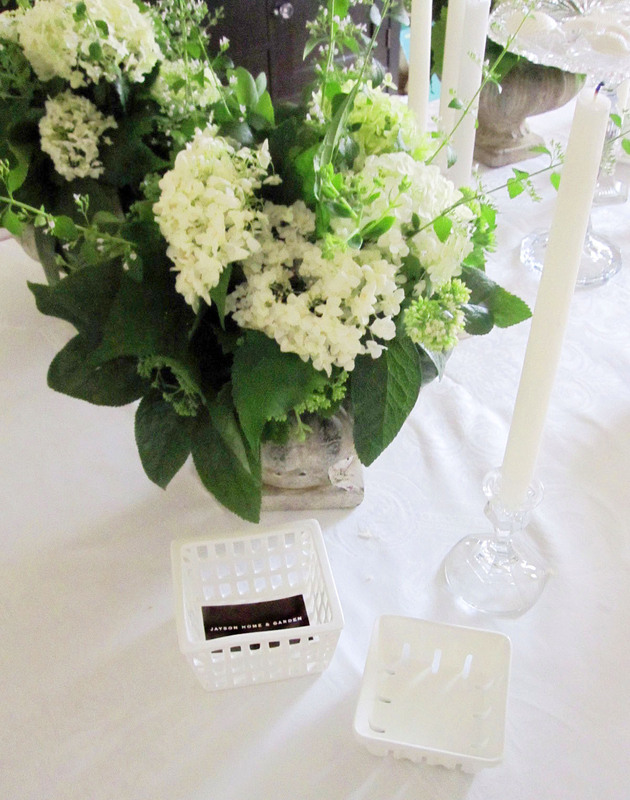 She bought them from Jayson Home and Garden online. I love the whole setting and you ladie look all great! and your mom is so cute buying the shoes you posted about, so cute! What a gorgeous shower!! Amazing! & the cookies are so cute! Wow!! What a tremendous job you all did. You hit on every detail of your sister's theme. Your neighbor's flowers are fantastic. Love the bakery items and I'm sure they were delicious. I was trying to zero in on the card that is on one of the tables. Is it a story about your sister? Your mom has a beautiful house; what a way to entertain and save a lot of money. What a beautiful bridal shower. Your attention to detail is amazing! Your sister is lucky to have you. You and your mother have a wonderful ability to throw absolutely gorgeous parties! I am wondering something... I remember you mentioned that your sister's wedding will only have 10 guests... mine will (someday) have only 8. 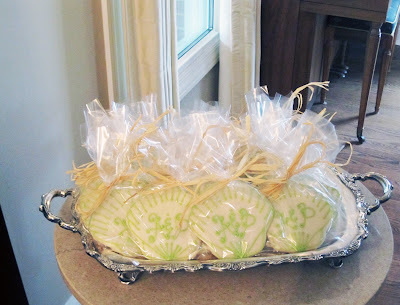 I've felt that I couldn't have a bridal shower because the majority of guests wouldn't be invited to the wedding. Did you get any feedback from the guests about this? And what was your family's thoughts? I'd love to share a shower with the ladies in my family but am unsure how to go about this. WOW this is long- Sorry! Feel free to email me directly (if you like) at mkschutz37(at)gmail(dot)com. I wanted to respond to Maggie. At the actually ceremony on the beach there will only be 19 people. 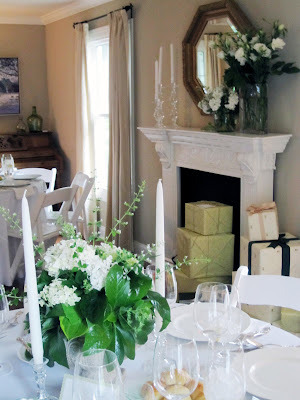 I am hosting a "celebration of marriage" party at my house in August. Everyone who invited to the shower is invited to the celebration. Still got some negative feedback from two about coming to the shower; but everyone else was very supportive. What a beautiful event! I just posted on the DIY nailhead trim bulletin board on my blog. Thanks for the inspiration! Simple, yet elegant and classy. Thank you for sharing the wedding planning process in its entirety. 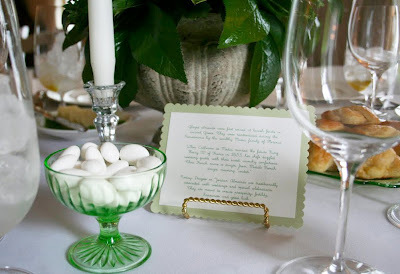 It is a great reminder that you can create beautiful parties and invitations that are meaningful, personal, HOMEMADE, and inexpensive. Very impressive (and BTW- I'm all caught up on your posts now!). Interesting what you wrote about Jordan Almonds. Nowadays they seem to be a much bigger tradition in the New World than in Europe. Thank you so much! I am glad that most people were understanding. :) Hopefully my family and friends will be, too. Thank you again for responding, and so quickly when I'm sure you have lots to do for this weekend! Congratulations! How lovely! Fantastic job pulling all the details together!